"You'll be proud to own one of these knightia Fish Fossils. They shows the beautiful detail of fossils from the green river formation. These fish fossils come from the Mid-Eocene Epoch and are about 50 million years old. The matrix measures about 3" with the fossil are between 2 and 2.5 inches long. 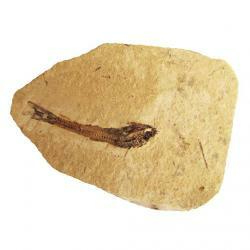 While these knightia fish fossils are genuine they have been enhanced with a brown dye to help show off the fossil. This is a sample of our inventory. Your knightia Fish Fossil will be very similiar to the one pictured here. As always your satisfaction is guaranteed with fossilicious.com. These fossils were found in South West Wyoming."